Every guy will experience some hair loss throughout his life. But thinning hair doesn’t mean you have to lose your personal style. 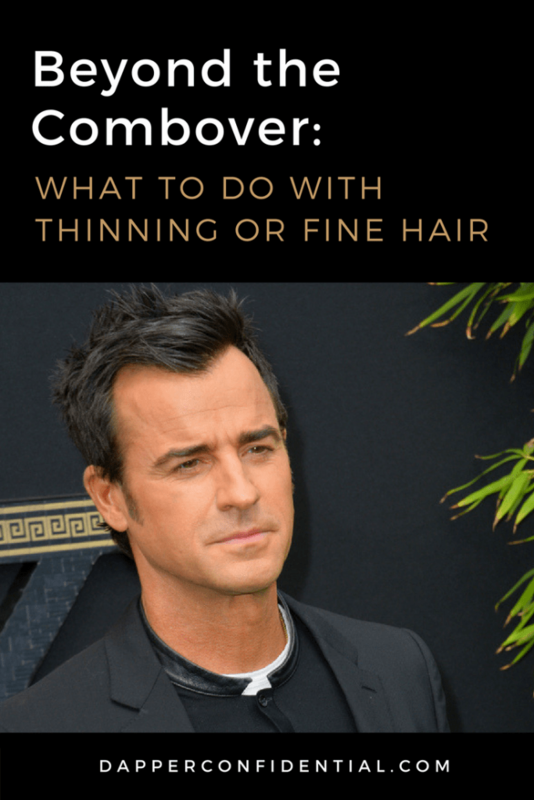 We talked to the experts for some styling solutions to help you resist the urge to comb over in the face of receding hairlines and thinning crowns. Thinning hair on men shows up a few different ways. Typical pattern baldness happens when the hair thins out at the crown. But you can work with this like Kevin Costner for example, by letting your hair grow out a little longer. 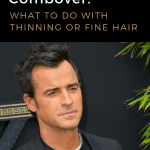 If your hairline is receding, ask your stylist to carve out sections on both sides of the hairline, like Justin Theroux. Then use a combination of R+Co Control Flexible Paste and R+Co Continental Glossing Wax to style. In the case of all-over thinning hair, keep your hair short and close to the head. Channing Tatum has baby fine hair, but you’d never know it because of his signature short cut. R+Co also has some great shampoos for making the hair appear thicker, like Dallas Thickening Shampoo and Conditioner, Cactus Texturizing Shampoo and Badlands Dry Shampoo Paste. For hair that is thinning on top, keeping a relatively short hairstyle with tight sides and back will give the illusion of volume on top. Use a texturizing spray like Oribe Dry Texturizing Spray to give the hair grit, and make it appear thicker. For a stronger hold, try a paste with a matte finish like Oribe Rough Luxury Soft, which will keep the hair from looking greasy and in-turn, thinner. I typically recommend leaving the hair longer in the areas of recession. This gives you more styling options to disguise the receding areas. Adding a root booster like Regis Powder Boost, coats the hair and gives it body. If you have receding or thinning hair in the front, try to steer clear of styles that pull the hair backwards like a pompadour. The pompadour look is one of the most popular styles we get asked about, but it not right for everyone. This style is only going to draw attention to your thinning areas. Doing a tight, fade cut on the sides and then blending the hair up into that thinning area, can help camouflage the problem. It makes the thinning look more intentional. If you have thinning hair, creams or matte products work best. Products that leave the hair with a shine are only going to draw attention to those thinning areas. You could also try a body building shampoo and conditioner to help with thinning hair. Paul Mitchell has a lemon sage shampoo and conditioner that helps build up the individual strands. To keep the hair healthy and prevent stripping it of its natural oils, I would suggest using these products every other day. I always tell my clients to build on the hair they have left. If your hair is thinning, book a consultation with a stylist who offers a microscope assessment to check the health of your scalp. A product containing minoxidil, like Nioxin, is usually the answer to clogged hair follicles. Hair loss is usually hereditary, although certain medications, thyroid diseases, protein deficiencies or skin conditions can cause hair loss, so see a doctor to determine treatment accordingly. If you’ve been thinning for a while and are starting to bald, prescription medications, surgical hair transplantation and platelet-rich plasma or PRP injections can all help. We offer PRP injections to our patients suffering from hair loss. The process involves withdrawing a patient's own blood, processing it so that only the enriched cells remain, and injecting it into the scalp to stimulate natural hair growth. Did you know that 66 percent of men will start to lose their hair before the age of 35...and it’s totally preventable? Most men think hair loss is inevitable and starts later in life than it actually does, so they wait until it's gone before they act. Currently there are two FDA-approved hair loss treatments on the market, Finasteride and Minoxidil. 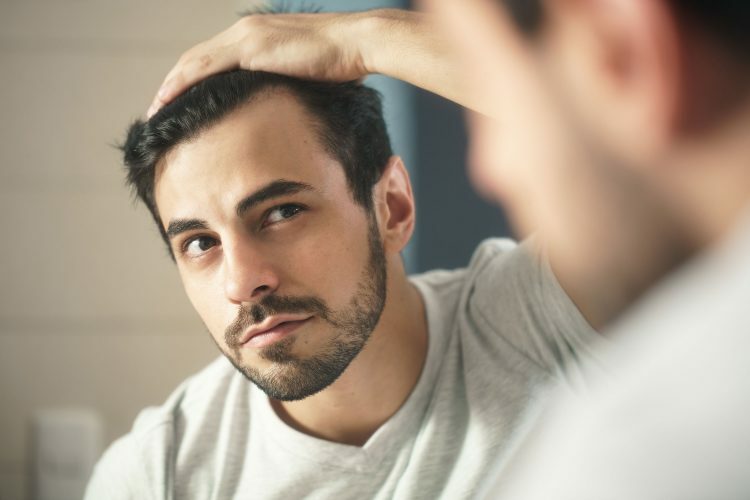 Research shows that while they only regrow up to 20% of lost hair, they are up to 90% effective at halting hair loss when used preventatively, either together or separately. Keeps, a new company focused on preventing hair loss, offers men a simple and scientifically proven way to keep their hair. The founders established Keeps to help men stay one step ahead of hair loss. If your hair is thinning and you’re not quite ready to live in hats or take a razor to your head, talk to your barber or see a hair loss specialist.